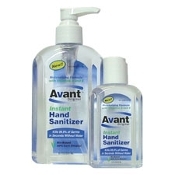 Hand Sanitizer - Tempo Safety Compliance & Supply, Inc.
Avant Original Instant Hand Sanitizer is a gentle, yet effective means of killing 99.99% of germs on hands within 15 seconds without soap and water. The product is clinically proven to kill a broad spectrum of transient microorganisms without damaging the skin. The hypoallergenic, dermatologist tested, formula contains Vitamin A and Vitamin E in addition to two moisturizers to soften and condition skin. Avant Original uses certified domestically grown corn ethanol and has undergone bio-based testing by Iowa State University. Avant Original has a pleasant, neutral fragrance and is FDA compliant.